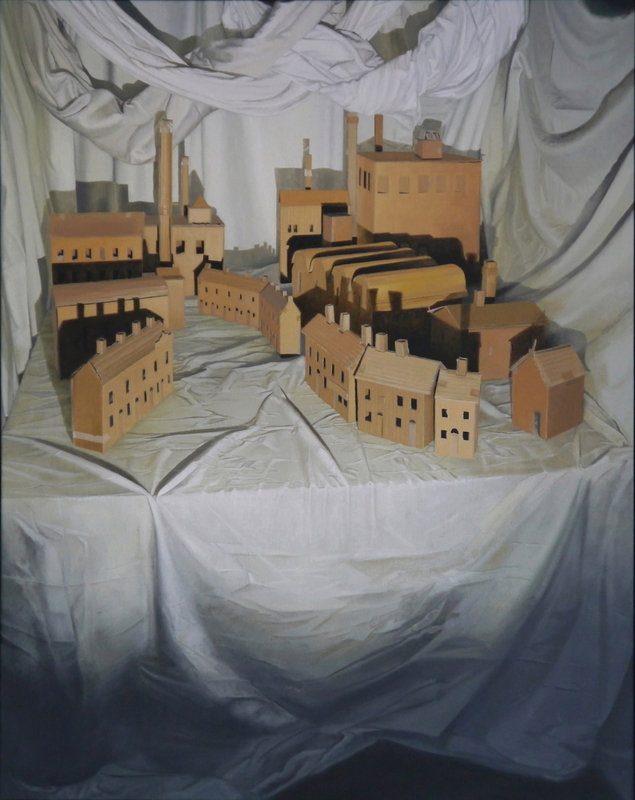 John Whitehill, who won the Figurative/Still Life category award in the Jackson’s Open Painting Prize 2018, is a British artist, living and working in Stoke-on-Trent. The subject matter’s in John’s realist oil paintings are his own hand-made still life constructions, which he makes using everyday materials. 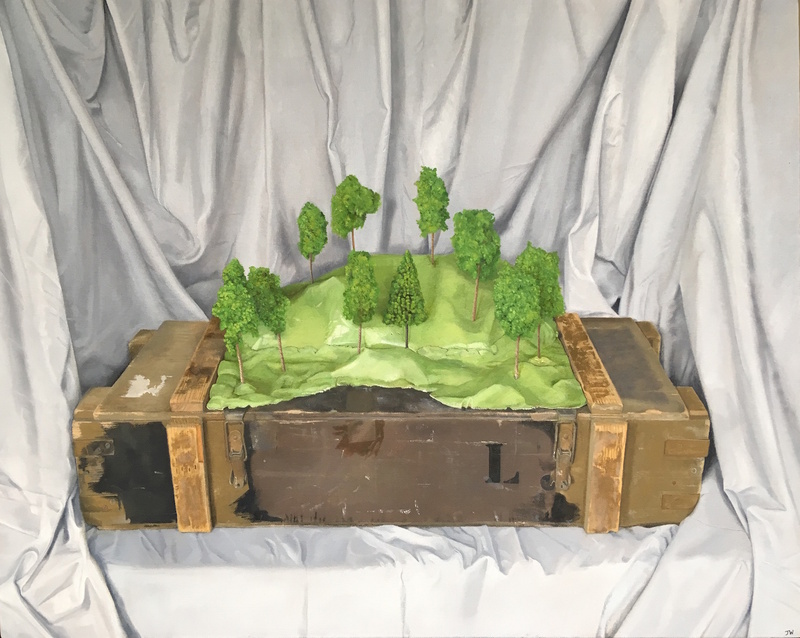 The models are inspired by architectural and natural structures and often reference scenes from art historical paintings. We got in touch with John to find out more about his practice. 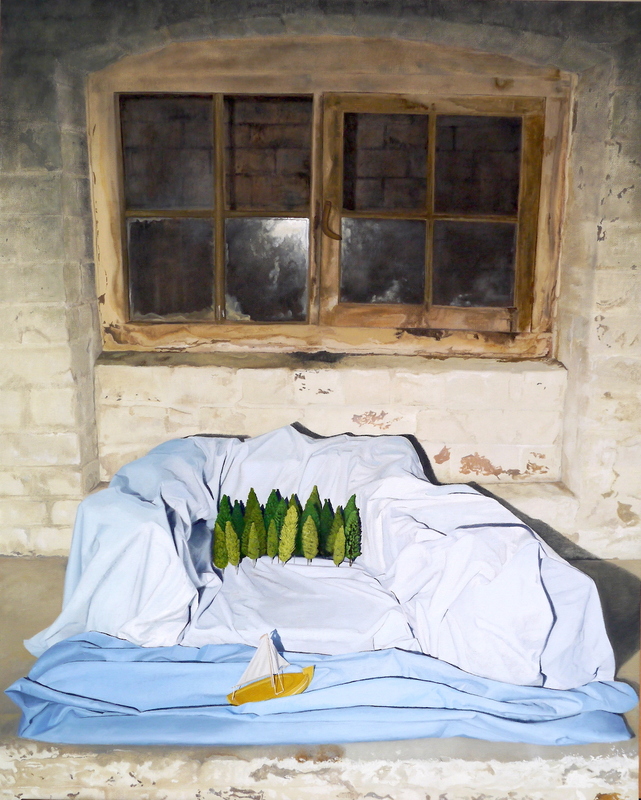 Clare: Congratulations on winning the Figurative/Still Life Award in the Jackson’s Open Painting Prize this year! Can you tell us about your art background/education? John: I left school halfway through 6th Form (year 12) unsure of my direction and spent the next three years working as a clerk in local government. I began my art education, which was a Dip.AD (pre-degree days! ), Fine Art at North Staffordshire Polytechnic, M.A. Printmaking at Chelsea School of Art and A.T.D. (art teachers diploma) at Liverpool University. After qualifying as a teacher in 1976, I then spent 34 years working in High Schools until 2009. During my time teaching I painted as much as work and family commitments allowed and since I finished teaching have been able to devote all my time to painting. John: My work is exclusively oil painting on canvas and is very broadly based on built or managed environments. Over recent years my paintings have depicted tabletop constructions of small buildings and landscapes created from card and plaster together with found objects. They are an ongoing interest I have in using the tradition of still life to suggest narrative possibilities to the viewer. Clare: On the artist bio on your website you mention you mainly paint “buildings, urban views, parks and managed landscapes”. What is it about these that you are drawn to in your art practice? 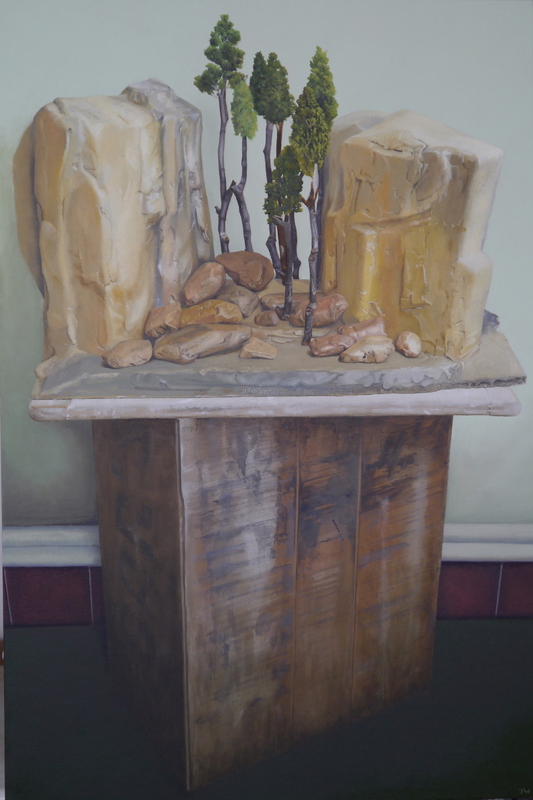 John: I’m drawn to the visual elements of solid geometric forms of buildings particularly when shown contrasted with the informal, haphazard shapes of foliage, or drapery in the case of my still life paintings. Another appealing pictorial quality for me is the atmosphere of mystery and even unease that can be created by the absence of figures in a built environment. 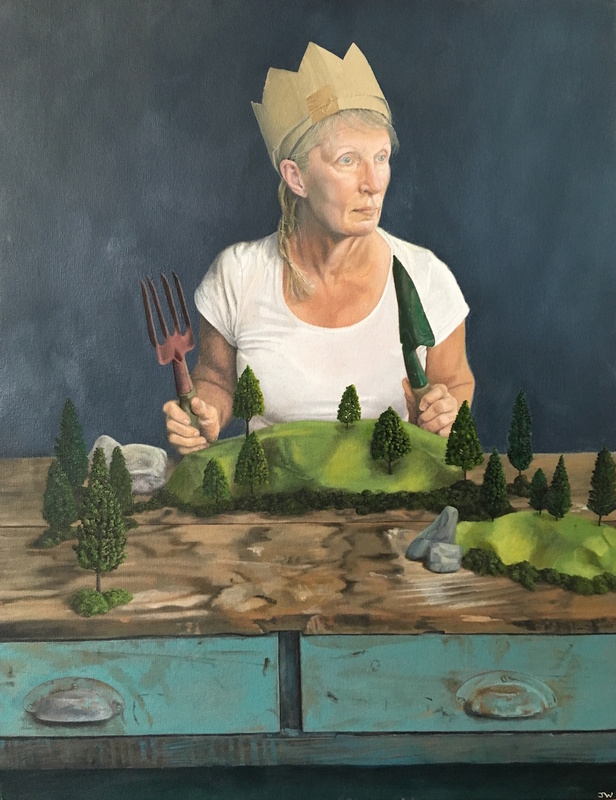 Clare: Some of your older work appears to be from the perspective of the artist outdoors, looking on from the outside of a house or down a street. Can you tell us about the transition to painting the models? John: The process of architecture amazes me. How an idea travels from a pencil sketch or an assembly of building blocks to become a fully realized structure occupying physical space often monumental/overwhelming in scale. I liked the idea of a very simple starting point reaching such a definite conclusion. Another influence on my thinking was of children using packaging and containers as structures to stage their play activities. I also referred back to my own childhood when I would create simple landscaping additions to my model railway set. These all fed into my idea to create models to paint from. I have always liked architectural models, admiring the aesthetic and technical skills used to craft them. The models I create are knowingly basic in construction using card glued or taped together. Any incidental blemishes, creases, rips or evidence of joining are incorporated into the painting. Clare: Do you still paint the real world? John: From time to time I do paint the ‘real world’ and still have a couple of long-standing unfinished paintings of the garden that I add a few daubs to when motivation moves me. Many of us involved in art will be alert to the visual potential that surrounds us. I regularly photograph or make a mental note of buildings, scenery and objects that catch my eye to create a library of images I could develop some time in the future. 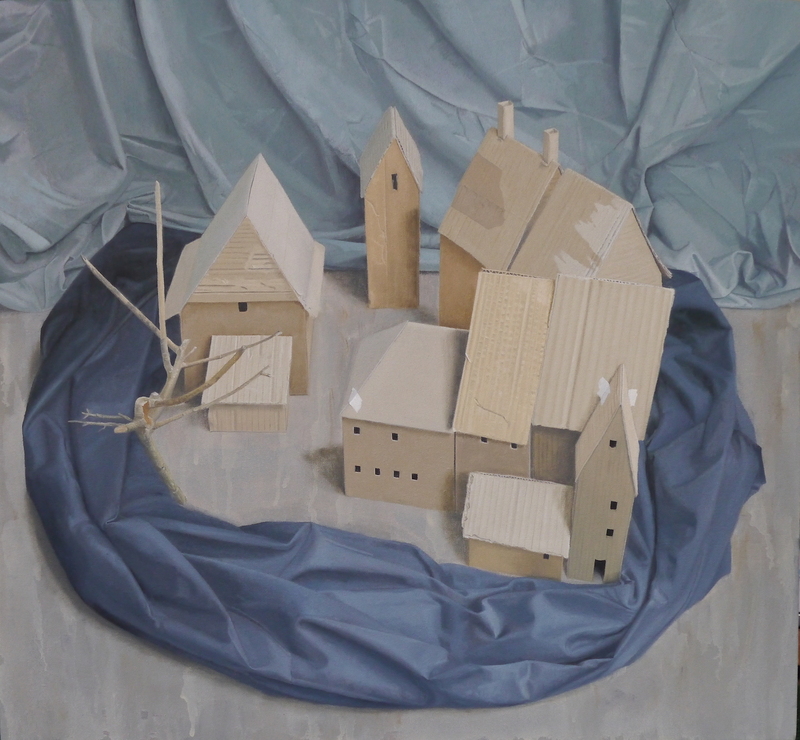 Clare: A number of your works depict scenery and buildings from historical paintings. Why are you interested in recreating these in your models? 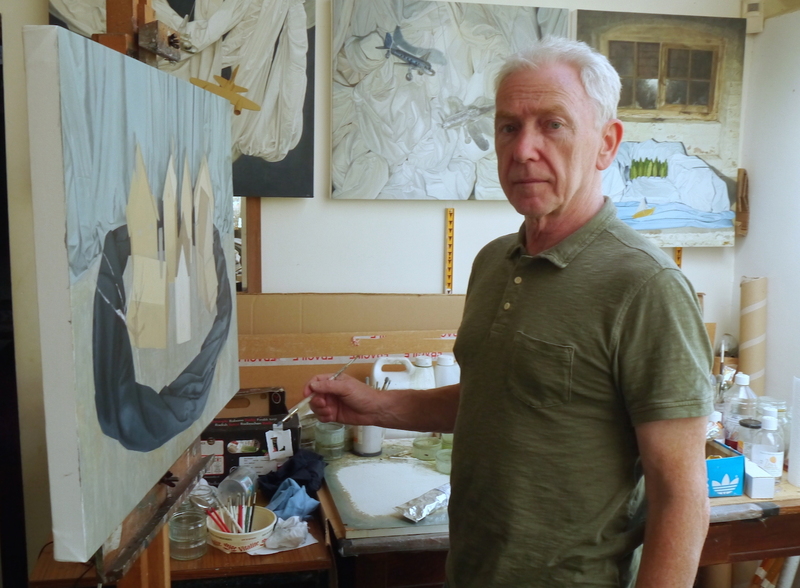 John: Throughout my time as a teacher I was constantly looking to discover new approaches and seek out subject matter with which to enthuse and broaden my students experience of art. Copying works from art history can be of some value but it can become stale if overused as a learning tool so I devised variations to the practice. I had students re-create objects from still life paintings using card and papier-mâché, arrange them as in the original then draw or paint the group. This has fed into my own work as I continued the practice of referencing art history as many artists have done. Those paintings I refigured/reimagined were chosen as they accorded well my working method. With the two ‘The Past Repackaged’ pictures I gave them a title which acknowledges the material used in making the buildings and passing comment on the tacky commercialization of art heritage. Clare: Why do you include the domestic surroundings around the models in your paintings? John: Art is artifice and I have always been interested in the notion of ‘the bigger picture’ showing the background to the focus of attention. I would like to make more use of surroundings and include locations that add another layer to a composition. Something that can infuse an image with a sense of intrigue. Often I will use lamps to add light and shade to a still life set up. The cellar of my house is a really good setting for this providing an interesting backdrop in keeping with the subject matter of some paintings. I keep a collection of different coloured bed sheets in my studio to delve into when needed as the backdrop for a painting. I vary colour and give as much attention to the folds as I do to the positioning of the featured foreground objects. Clare: Do you consider yourself a sculptor as well as a painter? Have you ever considered exhibiting your models? John: I regard myself as a painter but am aware of the sculptural potential of the models I make. 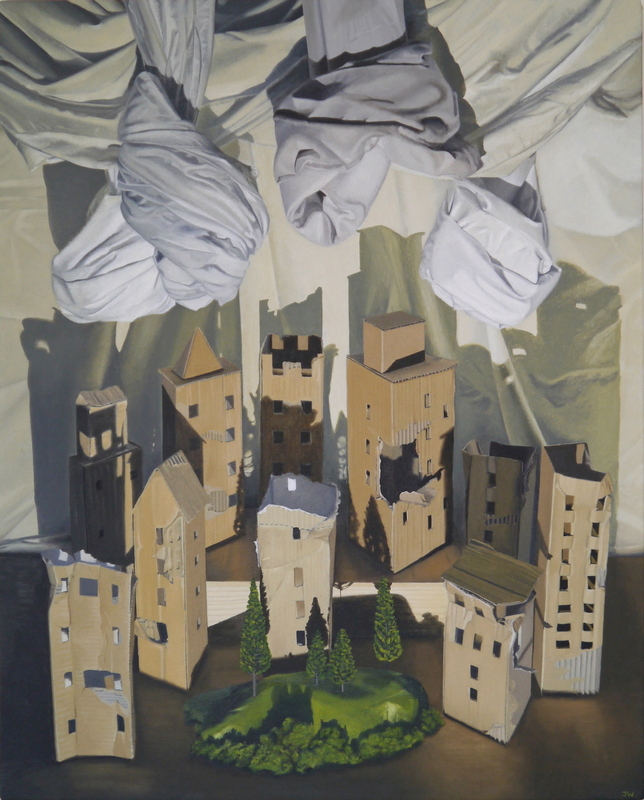 When I constructed the collection of buildings for the painting ‘Classical Legacy’ I thought the arrangement worked well as a site-specific installation. At the time I had a space in a large open plan studio, which had a number of irregular shaped storages areas leading from it. One of the spaces was a windowless, wedge shaped area where I set up my model buildings as a favela. In that particular setting, the models worked so well that I found the resulting painting disappointing in comparison. If an opportunity came along to create something in a suitable space it would certainly appeal to me. The models I make serve as subject matter for paintings however and are either destroyed or recycled for future projects. Clare: Do you always use oil on canvas? Do you have any favourite paints, mediums, brushes or surfaces? After white, which colour do you have to replace most often? John: My surface of choice is canvas using a variety of brands of paint including Spectrum, Old Holland, Michael Harding, W&N and Jackson’s Professional. For finer, detailed work I like Pro Arte Masterstroke brush sizes 0, 2/0 & 3/0 and for blocking in or larger areas I from the numerous different sized round, flat, synthetic and hog brushes I have amassed over the years. The colours I replace most often are raw sienna and paynes grey. I don’t use black. Up until a year ago, I used only pure or refined turpentine but now use either Zest It or Roberson Studio Safe Orange Solvent. I do still use turps substitute to clean brushes but try to limit the amount and frequency. John: My influences and likes change all the time as I discover or rediscover artists. The Internet has provided the gift that keeps on giving in this respect. The list of bookmarked artists sites on my computer is so long I could probably set an egg to boil whilst I searched for a particular artist. A few of the painters I have gone back to look at in recent months are Amy Bennett who is perhaps the closest but very different to my own work. She creates sets based on small town America using model railway buildings and landscaping foliage for her paintings. Other artists who caught my eye are Daniel Pitin, Matteo Massagrande, Stefan Hoenerloh and Danish painting in the late 19th/early 20th century especially L.A. Ring who I discovered on a visit to Copenhagen. John: Variety being the spice of life; Radio 4, sometimes 4 Extra, BBC 5 live on a Saturday or if there is nothing of interest on the radio, the iPod on shuffle playing a wide variety of music. I’m also currently working on a couple of paintings along the same lines as the Egon Schiele ‘Dead City’ series with the intention of submitting them to the Lynn Painter Stainers Prize.